Standby generators are the most popular types of generators in the US today. In regions with constant power disruptions especially, these generators can be found in almost any home. They may not supply power for heavy duty needs, but a good wheeled standby generator can keep your home warm and your main appliances on when you need them. If you are looking for an emergency generator, therefore, read the following Milbank generator reviews to view some of the most ideal generators for your emergency power needs. 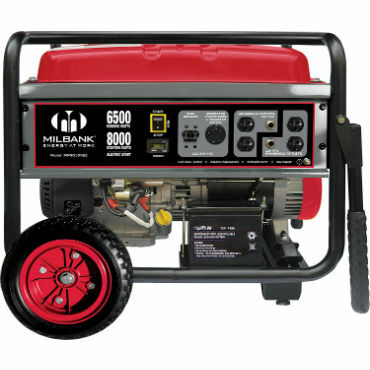 From a regular job site to a camping site, you can get enough power from a strong quality Milbank generator effectively. The company has been in the business for decades after all, and they have a great understanding of what it takes to keep the most important electronics in your home powered. Stay keen, therefore, and get to view the top six generators from Milbank and probably choose one that suits you the most. The Milbank MPG75003E is one of the most creatively designed standby generators you can get in the market today. It is almost difficult to ignore its design. However, the generator’s biggest strength point lies in something else, its power and reliability when you need it. The 7500-watt machine has the ability to reach 9000 watts at peak actually, and it will start almost immediately you touch its electric start. Once on, the generator can keep your home warm and lights on for up to 8 hours while on a half load. As already stated, Milbank invested heavily in the appearance of this generator. It follows in the footsteps of other Milbank models with a black and red overall design. The rugged body is protected by a metal frame all-round, while the engine is already cast-iron by design. And while it is heavy at 193 pounds, the generator is made portable with the presence of a wheel kit and expandable handle. According to multiple reviews, the machine’s strong construction helps it survive tough terrains and harsh weather for up to ten years. At peak,, the Milbank model can handle 9000 watts. On regular use, however, the generator will supply 7500 watts. This is still a great deal of power, and an average family will efficiently have their appliances and electronics powered for several hours. Thankfully, the Milbank generator supplies clean and safe power too, so that you can efficiently charge your smart devices without damaging their systems. On the other hand, the generator supplies its power quietly, sometimes more quiet than a typical human being conversation. The MPG 6500E incorporates Milbank’s rugged and reliable designs for excellent power delivery during emergencies. At its affordable price, the top rated generator features almost everything you would want in an emergency machine. 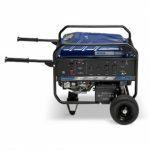 When it comes to portability, for instance, the generator is equipped with a strong pair of wheels and a comfortable handle to ensure you can maneuver it around. Here are the machine’s other features. The Milbank scores highly when it comes to quality of its construction. To start with, it features a metal frame for extra protection on all sides. On the other hand, it has one of its sides occupied by a well-labeled control display. The location of its motor and engine also displays the great workmanship that is Milbank generators. And not to forget, the machine’s black and red wheel kit also add an appeal to the machine. Overall, the Milbank model represents a high standard, a well constructed machine that could serve you for many years. With its cast iron 6500 watt engine, this generator is able to supply power to you main electronics for several hours during power outages. It works with a voltage-regulated power protection feature and a noise muffler to ensure you get the convenience you need. Its noise production levels are particularly low, and many reviews note that you almost won’t realize the generator is in operation. Again, its reliance on modern generator technology ensures that you get clean power to keep even the most sensitive electronics on at all times. You can easily control a variety of features in this generator thanks to its digital display. The different controls on the display are also well-labeled, and you could expect a great experience while using the machine. 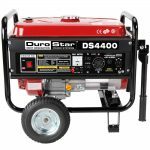 The generator features a one-touch electric start mechanism for easy startup. And the good thing is that the start function is supported by a battery for extra convenience. The Milbank generator is also easy to maintain, and it will cost you little in maintenance in the course of its service life. Designed for ultra-convenient portability, the Milbank2000IP is for you if you love traveling or going for road trips with your RV. A family in need of an emergency power generator can also consider purchasing the 2000IP model, but only if they need one or two appliances on during a power outage. While the small lightweight design is the generator’s biggest selling point, here are features that make it worth checking out. In its small size, the 2000IP model supplies clean enough power to charge sensitive electronic devices like TVs, laptops and smartphones. That makes this 2000 watt generator even more popular because most of its customers are people looking for clean power to charge such items. It also features a 120 Volt AC, to ensure you have an easy time using normal chargers to draw power from the machine. Think of it, the generator is much affordable than most other standby generators in the market. It probably supplies enough power for your needs and can run for up to 11 hours. Isn’t that great? Again, the machine can run on tandem, meaning you could get up to 4000 watts in your home for almost 24 hours. And still, the machine’s design with asymmetrical fans and protective features make it very reliable. The generator is very quiet, as it produces a noise level of 59 DBA or below. While on a low load, the machine can reduce its noise level to 53 decibels. On the other hand, the generator has a harmonic distortion of less than 3%, a 2-year warranty, and low oil shut down feature. It also comes with a light indicator, an AC overload reset, and a high efficiency mode. In the footsteps of other best selling Milbank standby generators, the Milbank takes a state of the art design, with a colorful mix of finishes. It is average in size, environmentally friendly and very efficient at supplying emergency power. With such features, the generator sets itself apart as a worthwhile machine, which you could buy both for home use and for worksite needs. 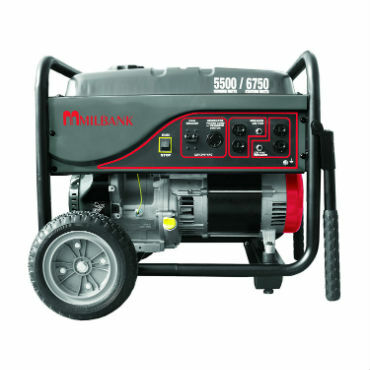 The Milbank model has a powerful engine with the ability to deliver up to 6450 watts. On normal load, however, the generator will comfortably deliver 500 watts of clean and safe power. It also incorporates inverter technology while delivering the power to ensure you get consistently clean power for your most sensitive electronics. On the other hand, the generator is engineered to work like your normal house plug socket. The 172 pounds weighing machine feels like a light load when pushed around on its never flat wheels. 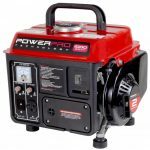 This makes the generator a convenient generator for any worksite operator, a camper or home owners who must maneuver the generator around. When it comes to design, the generator takes one of the most appealing finishes you can imagine of. It takes a rugged design, but with intricate finishes and presentation. The use of red, black and grey colors, for instance, increases its aesthetic appeal to a great extent. And still, the generator has a strong construction to help last for ten or more years. Thanks to the use of a pulse-Flo noise reducing technology, you can place this generator a few meters away from the house and enjoy its quiet operation. On the other hand, the generator combines its great construction and good workmanship to deliver result consistently. The durability of its parts also guarantees the reliability of its performance further, and so does its comprehensive warranty. The MPG1000I inverter generator is best suited for a contractor, someone who loves holding small outdoor events or a small family. This is mainly because of its small, space saving design and yet its ability to supply some good deal of power. The generator also features a verity of irresistible features, some of which are hard to find in a machine o its price range. At 30 pounds and measurements of 18.2*15.2*10.2, the Milbank model is both light and portable. To ensure it is even more comfortable to carry, Milbank designed it in a unique, easy to hold design. On the lower end, the small generator is well supported with rubber bearings. The digital portable generator incorporates inverter technology with well-engineered parts for an efficient performance. With its gasoline run design, however, the machine runs four cycles to deliver ultra-clean power. The first phase incorporates a noise reducing technology. It also features asymmetrical fans to enhance heat dissipation and overall generator performance. In the end, the machine is able to supply a comfortable 1000 watts worth of power. In addition, it supplies the power with a harmonic distortion of less than 3% and a frequency rating of between 50/60 Hz. And when used on half load, the generator is able to keep your most important electronics on for up to 9 hours. This generator features some impressive protective and impression features as well. Its main line breaker, for instance, is the high quality 2-pole toggle type. It features an AC overload reset and an oil shut-down feature. It is designed for easy visibility thanks to its high visibility points and a convenient indicator light. To enhance conductivity, the generator takes copper rotor windings. If you are looking for a medium to heavy duty portable generator, consider buying the MPG60002. IT features the incredible construction Milbank is known for, great convenience and has the ability to supply up to 7500 watts. If you also love a quiet operating machine, the Milbank model will impress you. It is tested to produce less than 59 decibels, and will hardly make irritating noise even at full load. The generator’s design speaks of the quality in Milbank generators. Every bit of its design is appealing, and especially its wheel kit and digital display. When it comes to durability, all the important parts like the engine are designed with a sleeve cast iron construction. And for further protection, the machine is secured by a metal frame all-round. Its wheel kit as already mentioned is both a delight in aesthetics and in operation. With the smooth rolling wheels, you will maneuver the 183-pound generator to your convenience. With a powerful Milbank generator that is constructed with a cast iron sleeve, the generator is able to deliver 6000 watts consistently for several hours. It incorporates the inverter technology on the other hand, which further makes its performance convenient for your home’s emergency needs. In addition, the generator is engineered to have less than 3% harmony distortion for utmost efficient power in your home. In addition to being attractive, the generator’s display is easy to operate. It is well labeled, and you can easily manipulate the generator in a number of ways to your convenience. The generator comes with a low oil shut down feature to help protect the engine. On the other hand, the voltage regulated machine comes with a comprehensive 2-year warranty. It also comes with a tool kit, a 30 amp cord, and a funnel to help you with oil refilling. Affordable – While they offer a lot of power, Milbank generators are also affordable. Most of the top rated models with the capability to deliver up to 7500 watts, for instance, rarely cost more than $1000. Easy to install and operate – You almost don’t need any technical know how to install or operate a Milbank generator. Almost anyone can set up these generators and power appliances with great convenience. As an added advantage, the top rated Milbank generators are switched on with a battery powered electric switch. 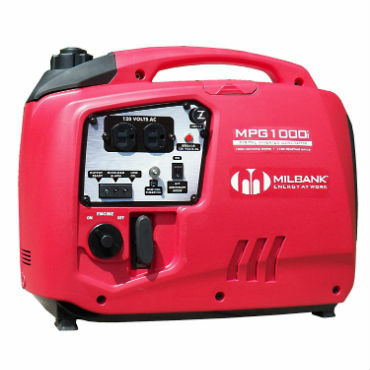 Wide Variety – From small 1000 watts generators to 9000-watt machines, you can get your ideal standby generator from Milbank. And despite their variety in wattage provision, all Milbank generators come with strong and durable constructions. Portable and Convenient – Milbank generators offer the convenience of portability thanks to their smooth running wheel kits. The smaller models are particularly designed for ease of transportation, as can be noted in their designing. Efficient Performance – Milbank generators are ideally designed to help you power your home’s essentials during a power break out. They, therefore, feature the inverter technology and great engineering for little or no harmonic distortion. Great Designs – Almost all Milbank generator have the same, state of the art designs. Ideally, Milbank engineers and places all parts of the generators accordingly while giving the machine appealing aesthetics. You must be present to turn it on. 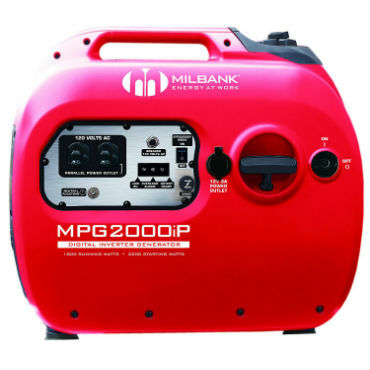 Milbank generators have fewer power outlets – Many of Milbank’s generators either come with one or two outlet points, which is often inconvenient. 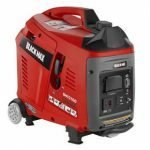 The generators lack some convenience features like a remote control – While many Milbank generators have a digital display, they lack some convenience features that are almost synonymous with top rated machines. Some of the convenience features it lacks include touch displays or LED lighting. After reading the above Milbank generator reviews, we hope it is now clear of what differentiates most of these generators; the wattage supplied. Other than that, any of the above top rated Milbank standby generators will serve you excellently for a long time thanks to great constructions. As for the price range, it is probably different. However, ensure you have identified the right size of generator you need before you decide how much money you wish to spend on the generator. 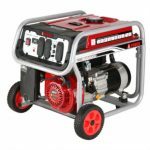 After all, finding the right generator for your needs is more fulfilling than and rewarding in the long run in terms of the services you get.